Third Man has the distinct pleasure of reissuing three classic singles from the Sun Records catalog — Carl Perkins' "Blue Suede Shoes" b/w "Honey, Don't! "; Johnny Powers' "With Your Love, With Your Kiss" b/w "Be Mine, All Mine"; and Earl Peterson's "Boogie Blues" b/w "In The Dark." While most Sun Records artists were from from the South, both Johnny Powers and Earl Peterson fittingly hailed from Michigan. 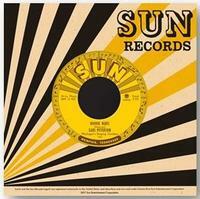 These singles bring Third Man's Sun Records reissue catalog, which also includes hits from Johnny Cash, Elvis Presley, Roy Orbison, and Jerry Lee Lewis, to a total of 13. 1. Blue Suede Shoes/Honey, Don't!